Long-lasting sculpting brow wax for perfectly-groomed brows. Salon Systems' Marvelbrow Brow Wax Pro-Palette is a collection of four defining shades of sculpting wax that grooms the brow in style! 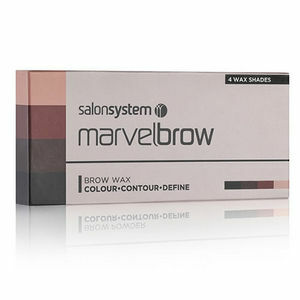 Your clients will love the way the wax fixes colour and builds volume without clumping. The mirrored compact contains four brow waxes (blonde, mid brown, dark brown, black/brown) and also contains an applicator brush. A versatile and long-lasting collection from the trusted name of Salon System.